Before we left for Aruba, I had moderate concerns about the food situation. I can generally find something to eat in most places, but the question is always, “Just how limited are my options going to be?” Eight nights away meant a lot of meals not prepared in the safety of my kitchen, and I knew that, try as I might, I would not be able to survive a whole week on rum cocktails alone. 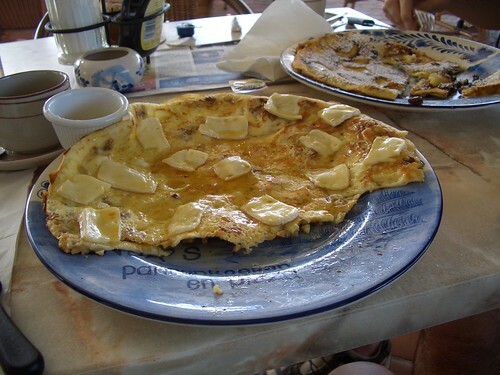 Fortunately, it wound up being pretty easy to eat gluten-free in Aruba. Most of the main hotels and resorts are at least familiar with the gluten-free restriction. Some even have a note on their menus instructing you to mention your GF needs to your server. Unfortunately, none go so far as to offer an actual gluten-free menu with pasta or bread-type substitutes. I think this wouldn’t have even been an issue, though, if we hadn’t planned such a long stay. A person can only take so many consecutive days of meat and potatoes, or shrimp and potatoes, or meat and rice….you get the point. I will say, however, that I never tired of the dessert options. Thanks to the Latin influence on the island, I don’t think we visited a single restaurant that didn’t offer some sort of custard-based dessert. I had several amazing flans and a couple of crème brulees that, beneath their perfectly caramelized crust, were as thick and rich as a triple cream Brie. We did have one shining moment of gluten-free joy that week, and it happened at a place that I wasn’t initially sure we could rely on. All we had to go off of was a lone TripAdvisor review from two years ago that mentioned gluten-free pancakes. No matter how hard I searched, I could find nothing else to substantiate those pancakes. The restaurant doesn’t have a website (UPDATE: Linda’s has since launched a website) and, once we got to Aruba, none of the hotel staff believed that any place in the area offered special GF options. So, on one of our last days there, we took a gamble on Linda’s Dutch Pancakes. 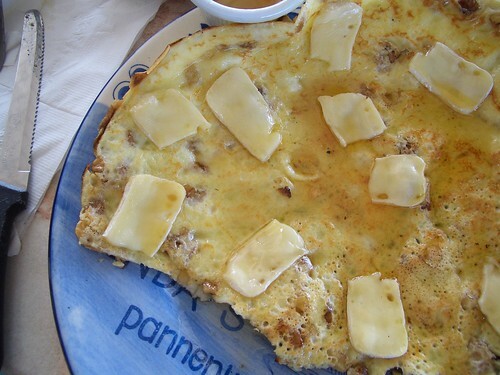 Dutch pancakes (or pannenkoeken, if you will) are not cakey like American pancakes. They are thin and light and eggy—and delicious gluten-free. Linda’s offers a wide range of “toppings” for theirs. I opted for the popular walnut and Brie with honey. Chris took the waitress’ suggestion and ordered one with apples and rum-soaked raisins. Being the sweet, loving husband that he is, he ordered his gluten-free as well so that I could have a taste. Both were very good and were a welcome change of pace from the grainy yogurt and under-ripe melon that had become my breakfast norm. Our waitress informed us that the owner (Linda, I presume?) added GF options to the menu after finding out that she could no longer eat gluten. It’s always comforting to know that someone who “gets it” on a personal level is responsible for your meal. And since the restaurant also serves pizza, we learned that she’d recently started making gluten-free pizza as well. We were at the end of our stay and already had our last couple dinners planned, or we’d have been all over that. I’m still curious to know how it is. So, if you’re planning a vacation in Aruba, know that you’ll be okay eating almost anywhere you go. But if you need a change of pace from the grilled meats, seafood, and breakfast buffets, head over and sample the gluten-free options at Linda’s. And if you try her pizza, stop by and let me know what you think. 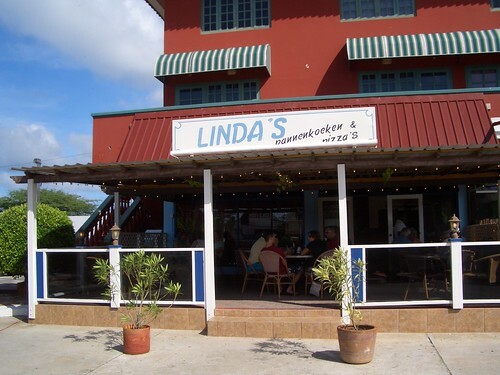 Would you be able to share the places you ate a safe gluten free meal in Aruba besides Linda’s which you mention above? I’m traveling to Aruba in July and would love some recommendations. Hi Jamie! So, while we were there, a lot of it was a matter of communication and careful menu item selection, which, as I mentioned, meant I ate a lot of grilled meats and potatoes. We also stayed away from cheap places where the bulk of the menu was breaded and fried–but that’s sort of a basic of gluten-free living. 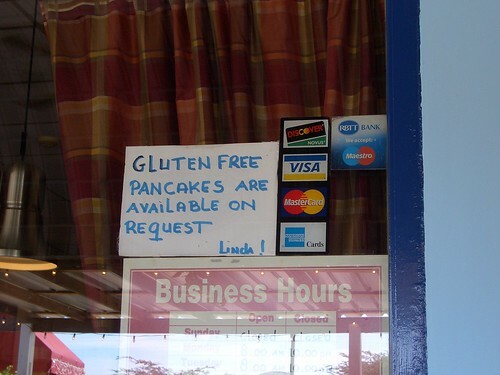 Linda’s was the only place I was able to find that had any special gluten-free items. As for specific places, we stayed at the Hyatt Regency and ate there a few nights. We explained things and asked questions and they were very considerate and accommodating. There are about half a dozen restaurants at the hotel, but we ate at three: Ruinas del Mar, Cafe Piccolo, and Foot Prints Beach Grill. At Foot Prints, you eat right on the beach by torchlight with your feet in the sand–it’s great! We also ate at a churrascaria called Texas de Brazil and nearly all of their meats were safe–I think there was maybe one breadcrumb-crusted thing offered the whole night. The last night we were there, we ate at a place called Papiamento. They have this “fish on a rock” thing where they bring you fish (or you can choose from other meats/seafood) on a searing hot slab and it sort of cooks there in front of you. The service was awful the night we were there, but it was probably the best meal we had during our stay. That and the atmosphere is nice–tucked away, live music, tables all situated around a pool. I’d recommend it, but you’ll want to make a reservation and be prepared to exercise patience (in case they weren’t just having an off night). So, in general, try to make sure you’re eating at places that have “clean” menus (i.e. few fried/breaded items) and communicate everywhere you go. The people of Aruba are really friendly and chill, so just own it and don’t worry about being a bother. Also, order a colorful cocktail with every meal and eat as much flan as you can stand–that seemed to work for me. Try Yemanja in Oranjestaadt! Complete gluten free menu and gluten free bread. They get it. We would like to inform everyone that we now have gluten free bread, as well as gluten free pancakes and gluten free pizza at Linda’s. Please check our our new menu on our website and the reviews of our restaurant on tripadvisor! I can’t wait to try out Linda’s on the first week of July! I am VERY sensitive to gluten and was so worried about the vacation there and now I can rest knowing I have a few options and Linda’s sounds like they go all the way when it comes to knowing about the gluten! see you then! I will be down the first week of July too….I am so glad to find out about the gluten free dishes at Linda’s…..my daughters has issues with gluten so this will be the spot we will hit!!! Thanks Britt, looking forward to pancakes and pizza while on vacation in September. hi…so happy to hear..i have a trip planned and was nervous as a newly diagnosed celiac…. My hubs and I walked to Linda’s from the Radisson. Was a scary 10 minute walk but totally worth it. My husband is recently GF and we were thinking Linda’s would be a no-go on our next trip. You just made my day!! Linda’s is a little of the beaten path and really doesn’t look like much but yum yum yum! My husband and I honeymooned in Aruba in Aug 2010 and are going back in Oct 2013. I’ve been GF since 2008, but I find European wheat doesn’t bother me nearly as badly as American. We hit a European grocery store for crackers and bread to keep in the hotel room, but I avoided gluten while eating out. I have done some research today looking for GF-friendly places and found both Linda’s and Yemanja, as well as the Brazilian place (it’s an international chain; we have one here in DC). I also found a couple of hotel restaurants that can cook GF for you if you request it, but they are very pricey. Just FYI, we ate at Papiamento our first time down there and were not overly impressed. It was very pricey and the food was not as good as at Madame Jeanette’s. If you’re going to spend $200 on dinner, I recommend the latter.